Give them their time in the sun. If George actually follows through on his promised fiscal plan they'll be running for cover soon enough. Even if the current account deficit comes down from 5% (how?) he needs the household sector stock debt above 185 % GDP to get his sector into surplus. Does anyone really believe this is possible? For that to happen we need: 1. a reflated Europe, 2. high investment by firms, and 3. rising real wages. Maybe we could look to 2 but 1 seems ever more remote and 3 requires a wages policy that would fly in the face of the Tory supply side approach. To me it looks like an EU referendum in May 16 with the economy entering recession. Gawd bless us all. Well, as SW-L says, if there is a recession then there will be other factors at play, and the contractionary fiscal policy that we are promised is only one factor amongst others. As a matter of fact I agree with you but the policy may still be subject to the same "adjustment" if we do indeed have a recession and the rationale will be the same - a vindication of austerity. "The media has no problem asking Labour politicians to account for why they borrowed too much (allegedly), but when George Osborne borrows much more than he planned, having previously stressed the importance of cutting the deficit quickly, this suddenly becomes unimportant. " July 2014: "George Osborne's deficit reduction plan under pressure as borrowing rises"
October 2014: "George Osborne set to miss deficit targets as Government borrowing jumps"
December 2014: "George Osborne will have to raise taxes to hit deficit targets, warns S&P"
December: 2014: "George Osborne is not the great Chancellor that he thinks he is"
December 2014: "Autumn Statement: George Osborne faces £50 billion 'black hole""
I chose the Telegraph because it is broadly sympathetic to Osborne and what he wants to do. No doubt there are many more such articles in the Guardian, FT, Economist or others. There are other articles in that time period - I can't be bothered to list them all. If your academic papers could be debunked as easily as your political forays, I'm amazed you managed to get a professorship at one of our leading universities. Congratulations for really engaging with the nub of Simon's post. GHJ: perhaps your media was complaining about Krugman who pointed out that austerity was relaxed after 2012 and with that came economic improvement. Krugman did not say that it was over-turned, but the change was enough to allow the economy to grow. Your GDP/capita growth is still worse than what happened during the great depression. As Krugman is want to say, "good going, guys." Have fun with him at Oxford. Wind your neck in and engage brain for a moment. No-one is saying that the media haven't reported the fact that Osborne missed his deficit target by a country mile. The point that SW-L is making concerns the failure of the media to equate the missing of the target with the recovery of the economy. Osborne has been pretty much unchallenged by commentators when he claims that Plan A was a) adhered to and b) responsible for the recovery. Indeed this seems a variant of the 'There is no austerity' analysis that seemed to get some traction in sections of the media/blogosphere a few years back, (e.g. http://www.themoneyillusion.com/?p=24017). Then argument then was that it can't be austerity that is causing low growth, because there isn't any. At least they seem to have moved on from that. But now it's "ok there was austerity, but at some point in time it coexisted with some growth, therefore austerity has no effect." 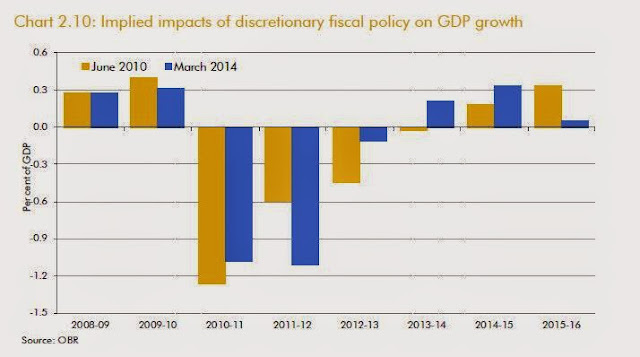 Finer points of timing aside, it's undoubted of course that austerity slowed the recovery. But the point you don't make is that the natural rate itself also deteriorates when recessions are (unnecessarily) prolonged. Actual private sector investment still languishes. According to the World Bank UK fixed capital formation as a % of GDP fell in 2009 to 16% where it has remained through 2013 (2014 data don't seem to be available yet). This figure is lower than other year since 1980 - i.e. lower, for 5 consecutive years, between 2009-2013, than any other year, including the recessions of the early 89s and 90s. Yes causality between austerity and these data is hard to strictly identify, but I can't rule out a priori that investment depends on anticipated demand, which in part depends on public spending. When this is reduced, then investment gets reduced. I guess you don't mention hysteresis as you don't need it to answer Smith's predictable but rather pathetic distraction, but I think the consequences are and will be much longer term than implied in your post. It is curious how incurably incurious journalists have been on issue of austerity. 2. That the public was seen as too stupid to understand the simple argument that borrowing more until interest rates are back under control would be best policy for them, as though it is better for the general public to carry on with its economy like a household budget thinking and its concomitant Tory-majority parliament. "In a free society, you do not succeed just by having the right ideas. You succeed by having the confidence to defend those ideas when they are under assault – and to see them through when the experts are counseling compromise." "Let me be clear: We will vigorously pursue the truth – and we will not tolerate wrongdoing." "Many rightly applaud the coalition government for maintaining a tough fiscal line. We must be clear why this toughness is necessary.It is not a numbers game. It is about livelihoods, and eventually rebuilding opportunities and greatness." "But unless you stay the political course, you will be neither robust nor popular. So, like the lady, the coalition must not be for turning. The financial crisis was a shock to the system. While the effects linger, it must not be used as an excuse by governments to roll back economic freedom. As Margaret Thatcher long ago foresaw: "Adam Smith's 'invisible hand' is not above sudden, disturbing movements. Since its inception, capitalism has known slumps and recessions, bubble and froth; no one has yet dis-invented the business cycle, and probably no one will; and what Schumpeter famously called the 'gales of creative destruction' still roar mightily from time to time." "In the short term, a government that is generous with other people's money – and prints more of its own – dangles the promise of a comfortable life, where all the essentials are taken care of. We are again learning, the hard way, that this is a false security." "Above all, a successful Britain would have a society that cherishes opportunity and creativity – making opportunity available to all, and believing that there is creativity in all, where individuals do not feel guilty of wealth or being exceptional, but work hard and exercise humility." There's economics and there's political reality. Osborne had to sound and look tough to reassure the markets, maintain the UK's credit rating and keep interest rates low. If there'd been the slightest suspicion that he wasn't serious about debt reduction we'd have been trashed a la Grecque. In reality he's managed as little austerity as he's been able to get away with. He understands realpolitik. That's why he's the Chancellor. What evidence do you have that there was any attack on UK credit rating or interest? The US did a fiscal stimulus and also had really low interest rates. You can say that the US is special, but you should have some evidence to back this up with regard to interest rates or credit. Do you really think that fibbing to the market and missing targets makes investors feel more comfortable with Osborne's handling of the economy? Don't you think that more economic growth such as we enjoyed in the US would have made the holders of debt feel bette? Anon 07:49 - I think you made a typo, what you meant to say was "he's managed as MUCH austerity as he's been able to get away with." Anyway, you clearly need to keep up with this column and read Macromedia Myths 1 and 2. The UK was never going to be like Greece. Apart from anything else, Greece lied about its finances for years. As for looking tough, that was for voters as in his first year he had terrible reviews in focus groups for looking like an idiot. The evidence was clear in the foreign exchange markets-sterling fell by nearly 30% in 18 months from its 2007 peak. i am not sure why the fall of the value of the pound meant that your government would be unable to borrow. Why do you feel that these two things are tied together? A drop in foreign exchange rates from a clearly overvalued pound -admittedly with a bit of overshoot, although not that much- is an attack on the UK credit rating? How is that supposed to work (please remember that the UK borrows in Sterling)? How are those notions even related? To boot: the drop happened before the election and had started to revert. There was no theoretical mechanism for a default to happen as a consequence of fighting the depression. The CDS spread never went anywhere, so there was no empirical evidence of risk either. But if you listened to Osbourne, it was not just a possibility but an undisputable fact. If Osbourne had claimed that the pound had been dropping a year or two earlier then he could have claimed some empirical evidence. But he was speaking of the UK credit worthiness which is a completely different thing. "we'd have been trashed a la Grecque." Stop conflating monetary system. Greece do not issue their own currency. A financial crisis that results in a plunging currency-who ever heard of such a thing? Well since I am in SE Asia presently, the massive falls in the baht, ringgit, peso, rupiah etc after the crisis of 1997/8 spring to mind. CDS spreads never went anywhere? Just about every other financial market was experiencing the most violent swings. David Smith's tag line is quite funny. "ALL THE ECONOMICS YOU NEED. Welcome to EconomicsUK, the personal website of David Smith, Economics Editor of The Sunday Times, London." Side note : I dislike it when folks chide economists for discussing politics. Politics obviously has a huge impact on macro policy and issues like income inequality. And we live in a political economy ._. Enough of the ad hominem attacks. And SWL, Krugman, DeLong, etc happen to be good writers. Yes, you only have to look at the EU and the Euro to see how politics trumps economics. In todays world economists are ignored while politicians, vested interests and the MSM are free to dictate policy. Economists are increasingly being forced into political waters in order to fight the misinformation campaign being waged against them. There is no way the Tories would have won the last election if there was any cut-through at all from todays most prominent macroeconomists. Simon should keep fighting the good fight.